Gov. John Kasich’s second term may be most remembered for the time he’s spent running for president, as opposed to the big tax policy changes that started during his first four years in office. But the last few years offer an opportunity to begin judging the economic results of Kasich’s early, bold tax moves. At worst, Ohio scores poorly, maybe even failing, in overcoming decades-old trends of trailing much of the country in jobs, wages and population growth. At best, Ohio has moved up in some rankings for jobs and population growth. Would Ohio be worse off without the tax cuts and tax shifting engineered by Kasich? Possibly. That’s difficult to evaluate. The trends generally have been going the wrong way for years. What is clear is that Ohio still lags most states in many areas. This, after sharp income tax cuts at the state level, coupled with budget and law changes that reduced revenue for cities – in many cases leading to tax increases at the local level. As Kasich winds down the last of his eight years as governor, cleveland.com took a look at national indicators. Ohio trails the nation in job growth during Kasich’s second term, as it has for every term since Ohio began electing governors to four-year terms in 1958, cleveland.com found. Since January 2015, when Kasich began his second term, the number of jobs in Ohio has increased by 259,300, federal Bureau of Labor data shows. That’s a lot of jobs. But if Ohio had followed the national growth of 6.6 percent, Ohio would have instead added 356,600 jobs – or 97,000 more jobs than were generated. 55,000 jobs during Kasich’s first term. 105,000 during Ted Strickland’s single term in office. 275,000 and 191,000 jobs during Bob Taft’s two terms. And 176,000 and 11,000 jobs during George Voinovich’s two terms. 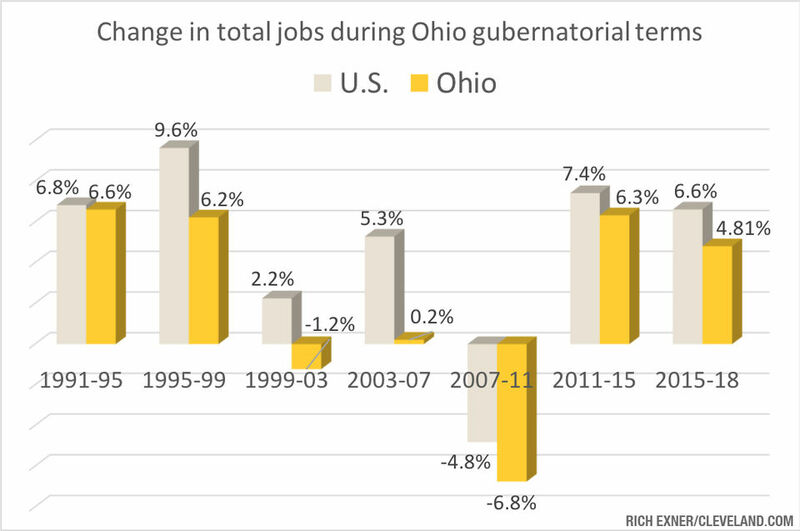 But for job numbers versus other states, Ohio has moved to the middle of the pack under Kasich – ranking 26th during his second term and 25th during his first term – based on percentage change in the total jobs. Ohio was 43rd under Strickland, 48th and 47th during the Taft terms, and 43rd and 38th under Voinovich. States ranked near Ohio during Kasich’s second term are Alabama (24th), Montana (25th), Delaware (27th) and Arkansas (28th). As for Ohio’s neighbors, they rank this way: Michigan (20th), Indiana (32nd), Pennsylvania (33rd), Kentucky (40th) and West Virginia (47th). Average pay for Ohio workers increased 6.9 percent over the last three years. But pay went up faster in 33 other states, the latest annual BLS data show. In Washington state, average pay was up 12.8 percent from 2014 through 2017. Pay was up 11.5 percent in California, and 9.9 percent in both Hawaii and Oregon. 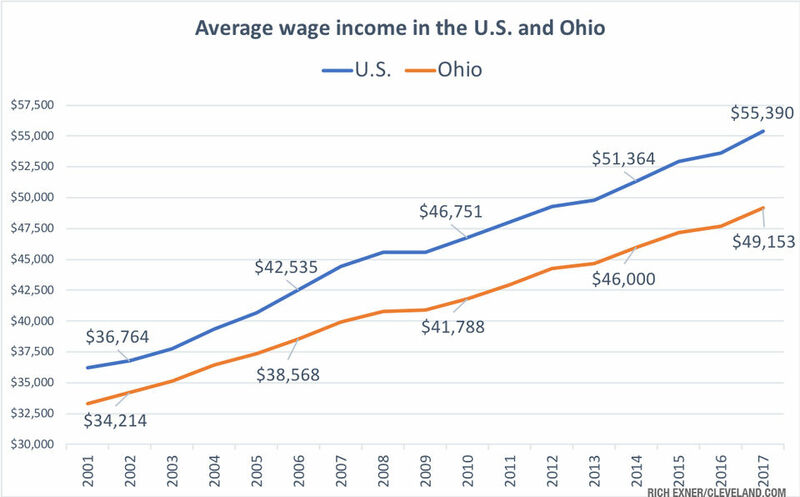 The once wage-rich industrial-driven state of Ohio is on the verge of slipping into the bottom half of states for average pay. Last year’s average of $49,153 ranked Ohio 24th nationally. Average pay ranges from $70,682 in New York and $69,929 in Massachusetts to $41,345 in Idaho and $38,788 in Mississippi. 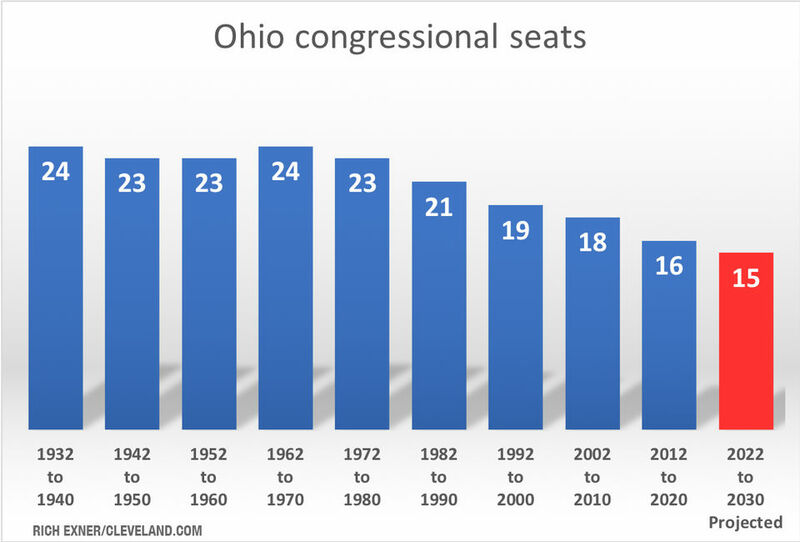 Ohio ranked 23rd in 2010, the year before Kasich first took office, was 22nd in 2006 just before Strickland took office, and 20th in 2002 just before the start of Taft’s final term. One way to easily understand Ohio’s slow population growth in relationship to the rest of the country is to look at Congress. There are 435 members the U.S. House, divided among states based on population. After the next census, Ohio is on target to drop to 15 members, down from 16 currently and way down from 24 as late as 1970. Ohio’s population is up 7.6 percent (825,280) since 1990, but rest of the country has grown four times faster (31.3 percent). The only states doing worse since 1990 are Pennsylvania (7.59 percent) Michigan (7.4 percent), Rhode Island (5.1 percent) and West Virginia (0.7 percent). But during Kasich’s final term, Ohio fares better than historically had been the case, ranking 33rd among all states for population growth at 0.7 percent. Ohio was 43rd during Kasich’s first term, 46th under Strickland, 45th and 47th under Taft, and 46st and 41st under Voinovich. Ohio, with 11.7 million residents, according to the latest estimates for 2017, accounts for 3.6 percent of the U.S. population, down from 4.4 percent in 1990. Twenty-eight percent of Ohio adults age 25 or older have at least a bachelor’s degree. This ranks Ohio 36th in the country, according to Census Bureau estimates for 2017. Nationally, the rate is 32 percent. Tops are Massachusetts (43.4 percent) and Colorado (41.2 percent). Ohio’s ranking has edged up over the last several years. Ohio was 36th in the final year of Kasich’s first term in 2014, 37th in Strickland’s final year in 2010, and 38th in the final year of Taft’s last term in 2006. But still ranking about a third of the way from the bottom tells us a few things. Ohio is older (older people generally are less likely to have college degrees), but Ohio is also not attracting high numbers of educated people, or educating enough people and keeping them home. Ohio is slipping in comparison to other states for the total number of adults with a bachelor’s or above. From 2014 to 2017, the number of Ohioans with such degrees increased 6.9 percent, ranking Ohio 38th nationally for change in this benchmark. The number of Ohio adults with bachelor’s degrees or higher did increase by 14,484. But this was fewer than in many smaller states such as Michigan (15,396), Arizona (16,074), Georgia (21,714), Colorado (20,184) and North Carolina (27,626). Ohio is just a little smaller than Pennsylvania, but Pennsylvania added significantly more people with a bachelor’s or above (24,463). Kasich, during a recent telephone interview with cleveland.com reporters and editors, said welcoming immigrants and creating attractive jobs can help boost Ohio’s population. He believes Ohio is making progress in creating new opportunities in technology and health fields. 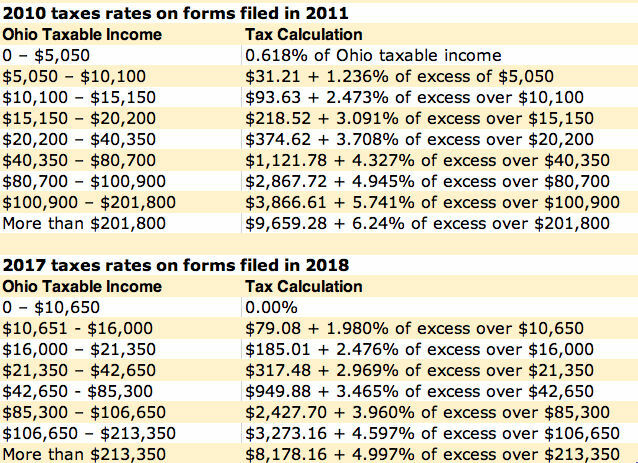 Source: Ohio Department of TaxationWhat were the big tax changes? Kasich focused on driving down Ohio income tax rates as a key part of his economic plan, continuing a trend that started before him. The cuts were across the board. As a result, for example, a taxpayer with an income of $65,000 is paying about $350 less a year in state income taxes now than before Kasich took office. Plus, state income taxes were completely eliminated for most self-employed people, the result of waiving business income taxes on the first $250,000. Property taxes are higher for senior citizens not already grandfathered into the old system where all seniors could receive a discount on their property tax bill. Now, only seniors with incomes below $32,200 can sign up for the discount. All new property taxes cost homeowners more than would be the case without changes under Kasich. The state previously paid 12.5 percent of the property tax bill for homeowners. This showed up as a discount in tax bills. Now that only applies to old taxes. Starting for taxes approved in November 2013, the state quit paying the 12.5 percent. The state sales tax was increased in September 2013 from 5.5 percent to 5.75 percent (county shares add more to the total). The first budget Kasich signed in 2011 cut by about half what the state shared with local communities through the Local Government Fund – reducing the total from $663 million in 2010 to $350 million in 2017. Cities across the state from Rocky River and Chagrin Falls to Dayton and East Liverpool -those run by Republicans and Democrats, large and small – cited cuts in state funding for the need to increase local income or property taxes. Additionally, cities and townships took a hit when the Ohio estate tax was abolished by the governor and legislature, effective Jan. 1, 2013. Only the richest 1/14th of the estates paid the tax with a top rate of 7 percent, but it was a key source of revenue for many smaller places. Eighty percent of the estate tax money went to local governments, amounting to a total of $308 million for communities across Ohio in 2012. Kent Scarrett, executive director of the Ohio Municipal League, said cities were hurt by those changes and others enacted by the state. For example, the state now collects corporate net profits taxes for the cities, taking 0.5 percent as a service fee before forwarding the money on to the cities, he said. And the state decided all cities must allow corporations the opportunity to carry losses forward for five years, reducing the amount of city income taxes owed, Scarrett said. This is lost revenue for cities that previously could establish their own rules. 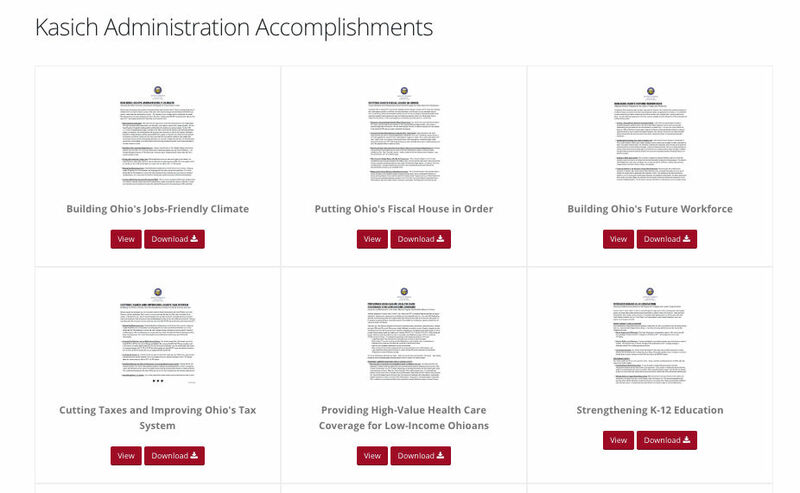 The Kasich Administration details its outlook at the Kasich Administration Accomplishments webpage. “Driving job creation” by cutting income rates to their lowest levels since 1982. And “encouraging more business economic growth” by simplifying municipal tax filings for businesses. This is a direction, Kasich said during his interview with cleveland.com, that Ohioans endorsed two months ago in voting to retain Republicans in every statewide executive office while the party took hits in some neighboring states. “If we weren’t healthier, the Republicans would have been turned out of office. People feel pretty good about our state,” Kasich said.